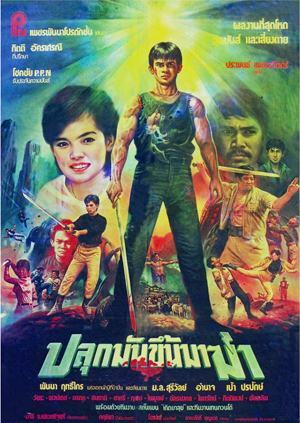 Thai movie ปลุกมันขึ้นมาฆ่า was released in year 1987 and lasts 1h35mn. It was released under VCD format. Four episodes were released, i.e. in year 1987, 1989, 1990, 1994. Panna Rittikrai had small budget for his movies but the result was extraordinary as Panna always made his movies through true feelings and dedication. Villagers capture Duang, an expert in black magic, who caused many troubles in the village. About to be lynched, they finally attach him to decide about his fate the next day. During the night, Duang succeeds to flee. Five years have passed. A group of travelling villagers is facing a weird young man played by Panna Rittikrai. He assaults them and kills most of them through extraordinary fighting skills. The village leader is worried as a group of Japanese visitors is coming to the village to see a sacred item. A group of Chinese visitors is also coming to the village for the sacred item, but they face Panna. Most of them are killed by Panna. The group of Japanese visitors, led by Suriwan Suriyong, faces ruffians (โจรร้าย) led by Pao Porapak. Ruffians are defeated. Learning that the Japanese group has arrived, the village leader sends his best two men to neutralise Panna. They also fail. All groups (Thai, Japanese, Chinese) gather to defeat Panna but they fail as he is like a ghost (blades don't hurt him). The village leader informs villagers and they decide to quit the village afraid to be killed by Panna. Duang, the former expert in black magic (หมอผี), enters the village. He was chased by the village leader five years ago and created fighter Panna through black magic incantations to take his revenge. Panna enters the village to chase the three groups. They cannot find any weak point. The black magic expert enters in the village again to see their defeat. The three groups try to defeat him in order to neutralize Panna. He seems also invincible (ฆ่าไม่ตาย). Only when he receives by accident a sarong (ผ้าถุง), feminine object, on his head then spike and blade can enter in his body, so he dies. Panna falls dead at the same time but then resurrects again. Only when a white magic expert gives holy weapons to Suriwan, then Panna can be defeated.